Hatari! (pronounced [hɑtɑri], Swahili for "Danger!") is a 1962 American action/adventure romantic comedy film directed by Howard Hawks and starring John Wayne. It portrays a group of professional game catchers in Africa. The film includes dramatic wildlife chases and the scenic backdrop of Mount Meru, a dormant volcano. Hatari! was shot in Technicolor and filmed on location in northern Tanganyika (in what is now Tanzania). Hatari! is the story of a group of adventurers in East Africa, engaged in the exciting and lucrative but dangerous business of catching wild animals for delivery to zoos around the world. As "Momella Game Ltd.", they operate from a compound near the town of Arusha. The head of the group is Sean Mercer (John Wayne); the others are safari veteran Little Wolf, also known as "the Indian" (Bruce Cabot); drivers "Pockets" (Red Buttons), a former Brooklyn taxi driver, and Kurt (Hardy Krüger), a German auto racing driver; roper Luis (Valentin de Vargas), a former Mexican bullfighter, and Brandy (Michele Girardon), a young woman whose late father was a member of the group; she grew up there and owns the business. Their method (shown in several action sequences) is to chase the selected animal across the plains with a truck, driven by Pockets. Sean stands in the bed of the truck with a rope noose on a long pole, and snags the animal by its head. (For smaller animals, Sean rides in a seat mounted on the truck's left front fender.) A smaller, faster "herding car," driven by Kurt, swings outside, driving the animal back toward the "catching truck". Once the animal is snagged, Luis, an expert roper, catches its legs and secures it. The animal is then moved into a travel crate and carried on a third truck, driven by Brandy. The captured animals are held in pens in the compound, tended by native workers, until they are shipped out at the end of the hunting season. In the opening sequence, the team chases a rhinoceros, but it attacks the herding car and severely gores the Indian, who has to be transported to the Arusha hospital. While they are waiting to hear about the Indian's condition, a young Frenchman (Gerard Blain) approaches Sean about taking the Indian's job. This offends Kurt, who knocks the Frenchman down. Then Dr. Sanderson (Eduard Franz) says the Indian may die without a transfusion of rare type AB Negative blood. However, the Frenchman has that blood type. He agrees to donate his blood for the transfusion. The group returns to the compound after celebrating the Indian's survival. Sean is surprised to find a strange woman sleeping in his bed, and a comedic exchange between Sean, Pockets, and Kurt ensues as they try to figure out what she's doing there. The next morning, she introduces herself as Anna Maria D'Alessandro ("Just call me Dallas") (Elsa Martinelli), a photojournalist sent by the Basel Zoo to record the capture of the animals they have ordered. Sean is annoyed, but under the contract with the zoo they must accommodate her. Dallas quickly makes friends with the others, especially Pockets. She rides along on the group's catching runs, snapping pictures. Dallas is immediately attracted to Sean, and (she thinks) he to her, but he treats her brusquely. Pockets explains that a few years earlier, Sean was engaged to a woman who came to the compound, hated Sean's life there, and abruptly left him. Ever since, he distrusts women, especially those to whom he is attracted. The young Frenchman comes to the compound and, after proving himself a crack shot, is hired to replace the Indian for the rest of the catching season. His name is Charles Maurey, but Sean dubs him "Chips". His job is to ride with Kurt in the herding car, carrying a rifle in case an animal attacks. The Indian returns, and urges Sean to forego catching any rhinos this season. A "nice Belgian kid" was killed in an earlier rhino chase, as was Brandy's father; now the Indian was nearly killed. He suggests there is a jinx. Sean agrees only to postpone rhino to the end of the season. Dallas makes some progress with Sean, but friction between them continues, especially after Dallas adopts first one, then two, and finally three orphaned elephant calves. This leads to her adoption into the local Warusha tribe as "Mama Tembo" ("Mother of Elephants"). Chips and Kurt flirt with Brandy, but as things turn out, it is Pockets Brandy falls for. This becomes clear to everyone on a day when the herding car flips over, dislocating Kurt's shoulder and cutting Chips up. Brandy doesn't react much to their injuries, but when Pockets falls off a fence and wrenches his back, she is nearly hysterical with worry over his "injury." Animal chases continue, with the group capturing a zebra, a giraffe, a gazelle, a buffalo, and a wildebeest. They also trap a leopard in a baited cage. When the herding car is mired during a river crossing, Chips shoots a crocodile that is threatening Kurt, and a strong friendship develops between them. Pockets spends several days privately tinkering in the compound workshop. He invents a method of flinging a net over a tree full of monkeys, which the zoos want. His rocket-net (which Sean declares a "Rube Goldberg machine") a is a success, catching over 500 of them. With all other orders filled, the group catches a rhino without serious incident, and the Indian agrees that the jinx is broken. The group goes to Arusha to celebrate the end of the season, but Dallas declines to go along. She is frustrated, because though she has had some intimate moments with Sean, he has never clearly declared how he feels about her. When Sean urges her to join the group's excursion, she lashes out at him and bursts into tears, leaving him baffled. The next morning, Dallas has vanished, leaving a farewell letter with Pockets. Sean and the group rush to Arusha to catch her. To help locate Dallas they take along Tembo, the first of Dallas's baby elephants, to track her by scent. Not wanting to be left behind, the other two follow the trucks to Arusha. The ensuing chase ends when the three baby elephants corner Dallas in a hotel lobby in town. In the final scene, Dallas is again in Sean's bed when he enters the room, and they reprise the dialogue from their first meeting. As before, Pockets also comes in drunk and again asks Sean "What is she doing in your bed?" But this time, Sean announces "We got married today!" After Sean herds Pockets out of their room, Tembo and his two brothers push their way in and break Sean's bed as the newlyweds try to figure out how to deal with them. Hatari! has a very loose script and, like many other major works of Hawks, is principally structured on the relationships among the characters, though it is "bookended" by the initial violent (and nearly fatal) encounter with a rhinoceros and the end-of-season determination to make such a capture to fulfil the team's quota. The script was written by Hawks' favourite writer, Leigh Brackett, after the group returned from Africa with the catching scenes. Much of the film revolves around scenes of chasing animals in jeeps and trucks across the African plains. The animals pursued are also all live, wild, and untrained. Capturing animals by chasing them down is banned today due to concerns of exhausting and killing the targeted animals. There is also the fact that, owing to the development of reliable animal tranquillisers and powerful dart guns in the decades since Hatari! was filmed, it's no longer necessary to lasso and rope the animals to capture them. At the beginning of the production, all Hawks knew was that he wanted a movie about people who catch animals in Africa for zoos, a dangerous profession with exciting scenes the likes of which had never been seen on-screen before. Hawks increased his knowledge on animal catching from the work of the famous South African animal conservationist, Dr. Ian Player. In 1952 South Africa was eliminating all large wild animals to protect livestock, and only 300 white rhinos survived. Player then invented his famed rhino catching technique to relocate and save the white rhinos. Player's project was called "Operation Rhino" and it was recorded in the renowned documentary film of the same name. Hawks studied this film closely and incorporated aspects of it into his film. Michèle Girardon (Brandy) spoke no English when cast in the role; she taught herself English while on the set, according to a July 1961 LIFE magazine profile of the actress. Government-licensed animal catcher Willy de Beer was hired by Hawks to be the closeby technical adviser, and his assistants became their staff of experts in regard to catching the animals. Hawks was inspired by the famous animal photographer Ylla, so he had script writer Brackett add the character of Dallas. Hawks said, "We took that part of the story from a real character, a German girl. She was the best animal photographer in the world." Filming in Africa was dangerous for the production team and actors. According to director Howard Hawks all the animal captures in the picture were actually performed by the actors; no stuntmen or animal handlers were substituted on-screen. The rhino really did escape, and the actors really did have to recapture it - and Hawks included the sequence for its realism. Much of the action sequence audio had to be re-dubbed due to John Wayne's cursing while wrestling with the animals. However, a stand-in, "Rusty" Walkley (real name: Mildred Lucy Walkley), was used for some scenes involving Elsa Martinelli. Hawks said Wayne admitted being scared during some of the action scenes, and "had the feeling with every swerve that the car was going to overturn as he hung on for dear life, out in the open with only a seat belt for support, motor roaring, body jarring every which-way, animals kicking dirt and rocks and the thunder of hundreds of hooves increasing the din in his ears." Wayne felt it was unpredictable with the terrain's hidden holes and obstacles which could have been disastrous. John Wayne wore a belt with his famous Red River D buckle on it, as he did in many of his movies. It can be clearly seen in the scene where Sean Mercer calls Arusha Control after the Indian is gored by the rhino in the opening of the movie; and again in the scene where Sonja the cheetah wanders into the bathroom while Dallas is bathing and introduces herself by licking Dallas and purring. As the animals frequently refused to make noise "on cue" (in particular, the baby elephants refused to trumpet inside populated areas), local Arusha game experts and zoo collectors were hired to do "animal voice impersonations". Hawks stated in interviews that he had originally planned to star both Clark Gable and Wayne in the film until Gable's death finally ruled that out. Hatari! introduced the memorable Henry Mancini tune "Baby Elephant Walk". Another memorable musical moment is a duet of Stephen Foster's "Old Folks at Home" (Swanee River) with Dallas playing the piano, and Pockets playing the harmonica. Ngorongoro farm, owned by Hardy Kruger from 1960 to 1973, served as the movie's setting. Hatari! grossed $12,923,077 at the box office, earning $7 million in US theatrical rentals. It was the 8th highest-grossing film of 1962. Jean-Luc Godard listed Hatari! as one of the best films of its year of release. Michael Milner adapted Leigh Brackett's screenplay into a paperback novel published by Pocket Books in 1962 as a tie-in to the movie. The cover features the movie poster of the rhino attacking the catching truck. The novel goes into more detail about some aspects of the animal-catching, particularly about Pockets' rocket net project, and about the pursuit of Brandy by Kurt, Chips, and Pockets. The book is a little edgier than the film, but it is a fast read and faithful to the movie. The novel's ASIN number is B000BJUQP4. 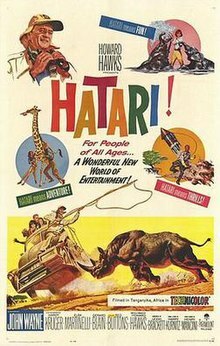 ^ a b Box Office Information for Hatari! The Numbers. Retrieved June 13, 2013. ^ LIFE. Time Inc. p. 80. ISSN 0024-3019. Retrieved January 31, 2015. ^ "All-time top film grossers", Variety, 8 January 1964, pg 37. ^ "Jean-Luc Godard, Cahiers du Cinema Top 10's, 1956-1965". Retrieved 2019-04-14.